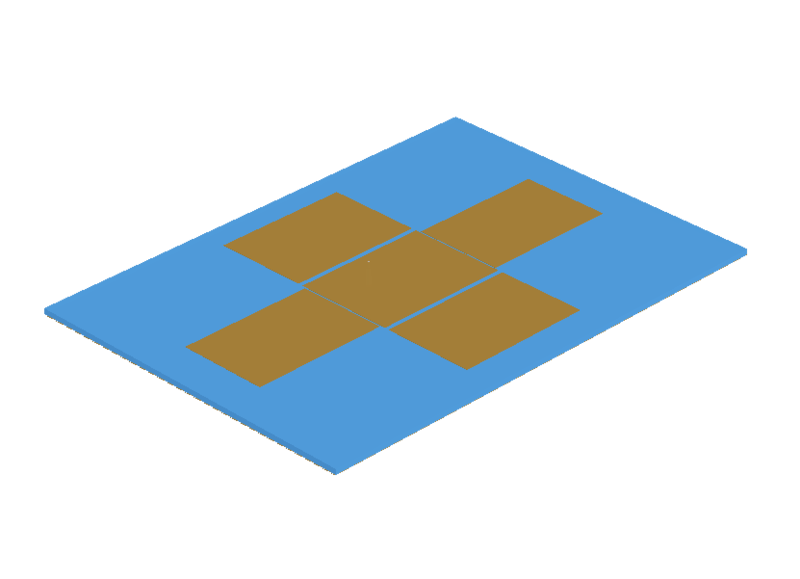 Image of the Pin-fed Four Edges Gap-Coupled Microstrip Antenna (FEGCOMA). 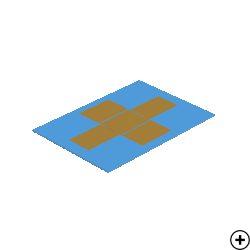 Although microstrip antennas are very popular in the microwave frequency range because of their simplicity and compatibility with circuit board technology, their limited bandwidth often restricts their usefulness. Various methods have been suggested to overcome this limitation – including the use of gap- or direct-coupled parasitic patches. In the FEGCOMA, these parasitic patches are placed alongside all four edges of the driven patch element. The introduction of parasitic patches of slightly different resonant lengths yields further resonances improving the bandwidth and gain of the standard patch. In this case, the structure is optimized to obtain a well-defined, designable bandwidth with near-optimally spaced zeros. Typical gain values of 10 dBi may be expected, with a designable fractional impedance bandwidth between 12 % and 30 %.